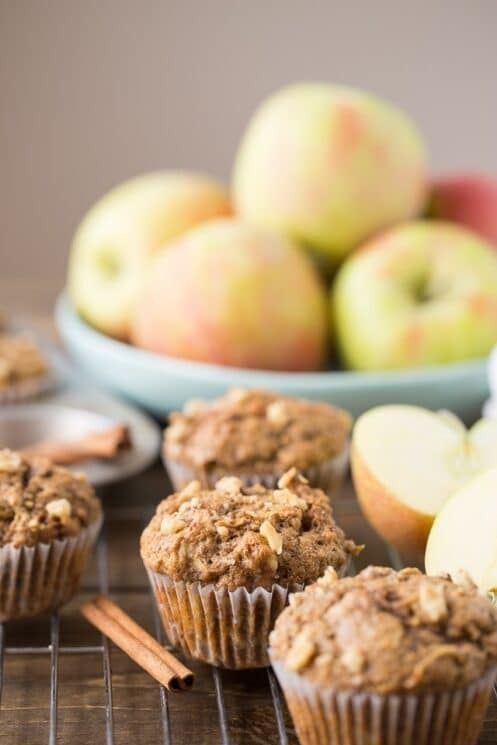 Made with whole wheat flour, coconut oil, applesauce and maple syrup these Healthy Apple Muffins will be your new favorite apple recipe. If you love fruit in your muffins, try our amazing Banana Muffins! Muffins are an interesting food. Sometimes grocery stores like to masquerade cake without frosting as a muffin. So you think you’re getting something semi-healthy when really you’re just eating dessert. Muffins are supposed to have a different texture than cake! 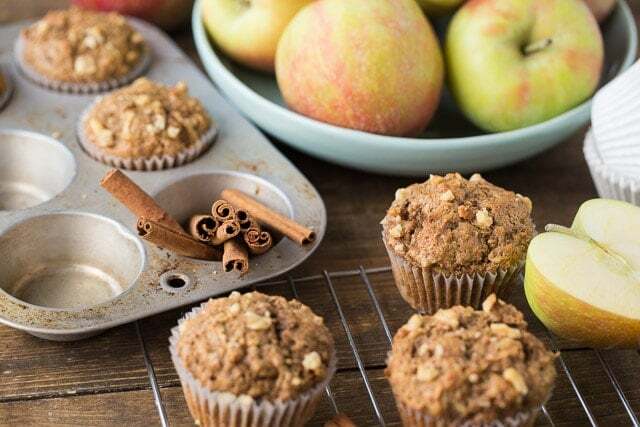 And these healthy apple muffins are made with no refined sugar, but with maple syrup instead. A delicious muffin doesn’t need lots of sugar and fat. This muffin really highlights the delicious taste of the apples instead of masking it with an overly sweet sugar flavor. 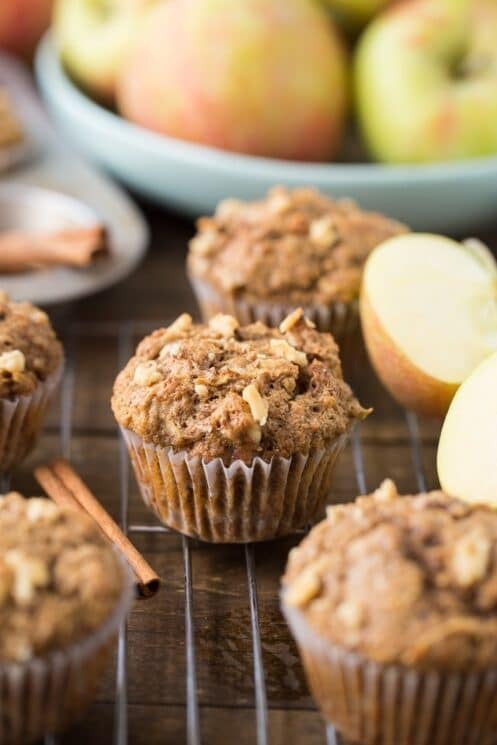 These apple muffins include fruit, but also nutrient dense ingredients like whole wheat flour, coconut oil, and walnuts. Use fruit to decrease some of the oil. 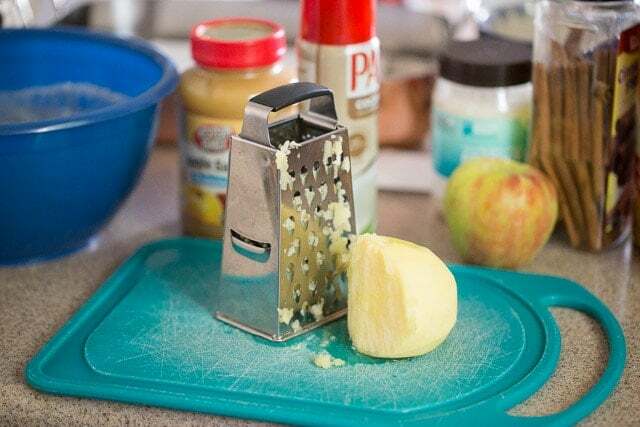 Applesauce is a great substitute for oil and adds a lot of moisture and flavor. Use whole wheat flour or half and half. This adds fiber and lots of vitamins and minerals to your muffin. Add healthy add-ins to boost nutrition. Chopped fruit, shredded veggies (like carrots or zucchini), nuts and dark chocolate chips all add great nutrition to your muffins. What Apple variety is best for baking? Does it matter what types of apple you use in baked goods? Yes! It affects the texture and how sweet your baked good is. In a recipe like this, most of the sweetness will be based off your apple and so you will want to use a sweet apple. I used Honeycrisp because I like the way they bake and they’re super sweet. Granny Smith is always a fine and safe option but they’re more on the tangy side, that’s why most people love to mix Granny Smith with sweeter apples in their pies. 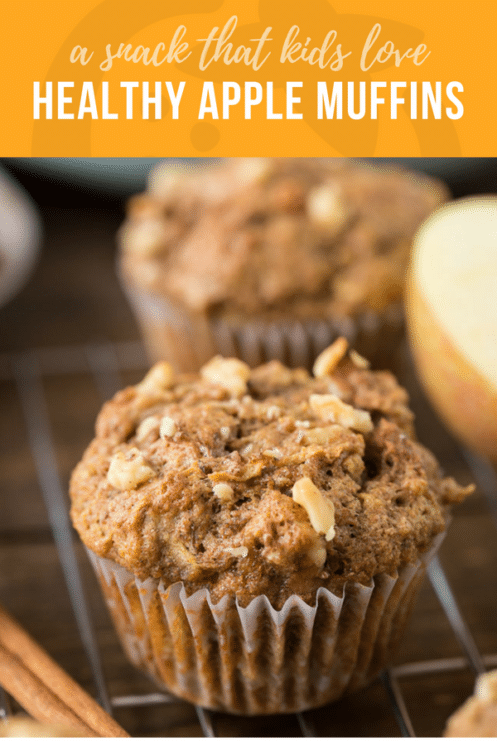 There are plenty of great apple options, just find what your grocery store has available and these Healthy Apple Muffins will be a hit! You can also try our Healthier Caramel Apple Cake! I used walnuts in this recipe because I love walnuts with all the warm fall flavors. If you or your kids don’t love them like I do, then leave them out, it won’t affect the muffin recipe. You can also swap the walnuts for a different type of nut. I like to use nuts in muffins for the texture and the added protein. It makes me feel fuller longer so I don’t end up snacking on whatever I can find 30 minutes later. You can always chop up the nuts super fine if your kids aren’t wild about them. What Can You Serve with Muffins for Breakfast? You can serve these warm, cooled, with honey butter or jam. We really like to serve our muffins with a side of eggs. If you are in a hurry a boiled egg is a great choice. But scrambled eggs pair well with these also. If eggs aren’t appealing to your kids, then a smoothie with ingredients that includes protein is also a good choice. The difference between an amazing muffin and an ok muffin isn’t very many steps or time when you are making them. 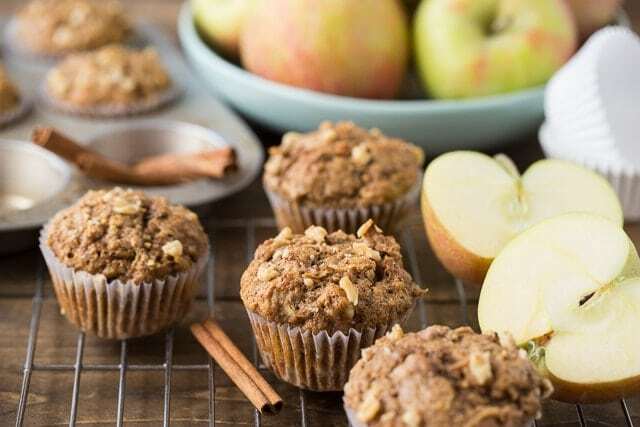 If you follow some of these steps, your apple muffins will turn out amazing! If you want a full, rounded muffin then fill your muffin tin almost to the top. If you are going to fill your tins full, make sure you batter is pretty thick. A thin batter will rise and run all over. Try to measure out the same amount of batter for each muffin so they will cook evenly. Don’t overmix your wet and dry ingredients! If you overmix, then your muffin won’t be light and fluffy. Cool your muffins to room temperature. Place muffins flat in your freezer for about an hour until they are mostly frozen before packing them in an airtight container. Place your muffins in an airtight container like a ziploc bag or glass dish to keep air out. Frozen muffins will stay good for up to 3 months. Let your muffin thaw at room temperature. Take about 30 minutes. Wrap your muffin in foil and heat in the oven at 350°F for 10 minutes. Need more muffin recipes? We got you! 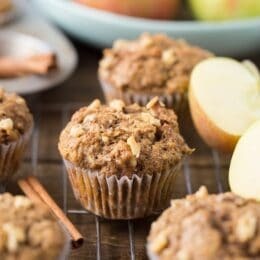 I made this Healthy Apple Spice Muffins for my Kids from the recipe,They were absolutely delicious !! Thanks for sharing this nice cake recipe. Any substitute for the coconut oil? Thanks! Any type of oil or even melted butter will work! I just made these with my son yesterday and they came out moist and delicious! Thank you for the recipe. I didn’t have coconut oil so I used melted butted instead without any issue. So glad you liked them! Yes you can use any other liquid oil and it should work fine. I just made it. This is so good! I bet my kids will be so happy with this muffin. Thanks! Why would you add salt to children’s ‘super healthy’ muffins? You can always leave it out! Make each recipe your own! It’s always a balance to try and get the taste right and keep as much flavor as possible! Can I replace the whole weat flour for white flour? I know it won’t be as healthy but will they still have the right taste and texture? Yes of course! You can always swap out white for wheat or wheat for white! My picky 10 year old eater has been loving these…I bumped up the cinnamon just a bit and went to one cup of maple syrup… more for my taste than his. Very moist. I want him to feel full in the morning at school, and this with a green juice on the side has been doing the trick. I LOVE that! And I love the changes you made! Can I use raw honey instead of maple syrup? Will it change the taste too much? You can make that swap! 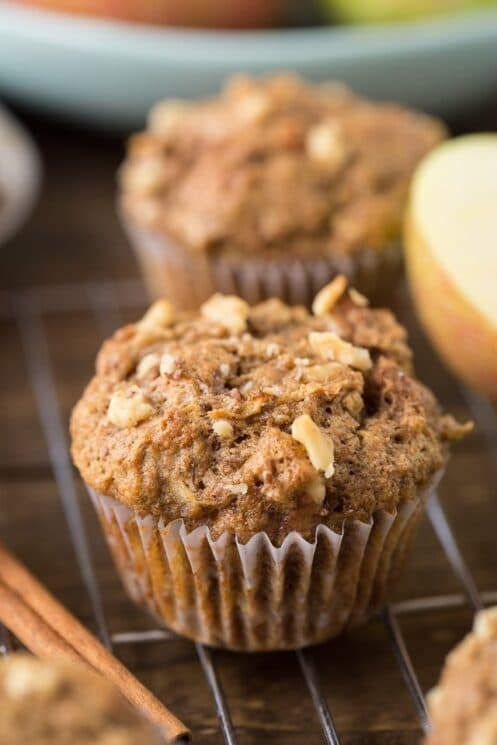 The maple syrup but gives a deeper flavor, but you’ll still love the muffins with honey! Hi! What can I use to sub the egg and make it vegan? You should be able to use applesauce! Do these freeze well? Thinking ahead for a weekend excursion with 4 little ones! Sadly, my 14 and 10 year old didn’t like them. They came out moist and fluffy but just not much flavor. Probably calls for more syrup and more salt. I also used Fuji apples, so that might have been part of the problem. These sound great but my daughter is gluten free due to having Celiac disease. Do you think a gluten free flour would work in this recipe? We haven’t tried subbing flours much in our recipes, but if you try it, let us know how it turns out! This recipe calls for just whole wheat flour. These are the best muffins I have ever had! My husband loves them as well. Absolute perfection!! So glad you like them, Kate! Hi Lily, sorry about that! Yes, we’re having a technical issue with our recipe plugin today. We’re working on fixing it now. Thanks for your patience! I don’t understand these measurements? Hi Kelly, sorry for the confusion! We had some glitches to our recipes following a big update to our site last weekend. The amounts should look normal to you now. Thanks for your patience! I’m confused on the measuring of this (333/500 cup???) is it antypo or am I reading it wrong? Hi Jenny, sorry for the confusion! We had some glitches to our recipes following a big update to our site last weekend. The amounts should look normal to you now. Thanks for your patience!